The Beech family (Fagaceae) is a large group of trees that includes the beeches, chestnuts, chinkapins and the oaks. The oaks (Quercus) include as many as 60 species in North America. Within the Quercus genus are two divisions of oaks—the white oaks and the red oaks. These trees have differences in their leaves, acorns and bark that the “National Audubon Society Field Guide to Trees” says you can employ to tell them apart. 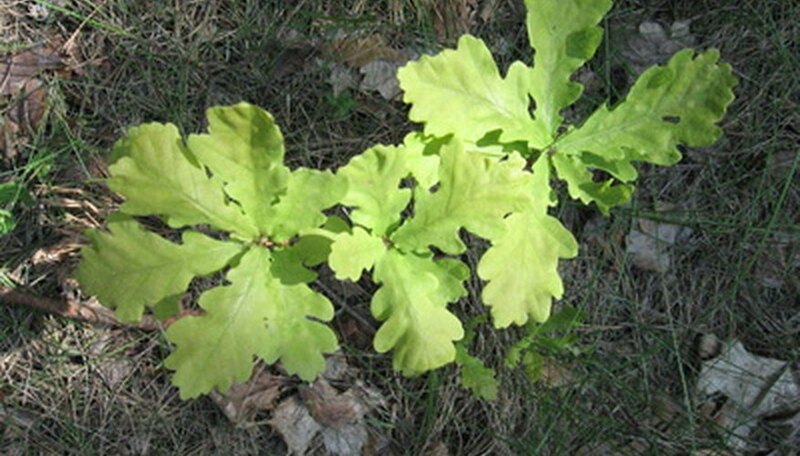 The leaves of an oak tree are important indicators of the oak group to which a species belongs. The leaves of the white oaks typically feature lobes with rounded ends, like on a bur oak, or foliage with edges with rounded serrations all along their margins, which is the case with the various chestnut oaks. The red oak group includes leaves with an array of appearances. Some of these trees will have leaves that possess a more pointed lobe, with the lobes tipped with bristles. Other red oaks will have spiny teeth on their margins, some will have smooth edges and others may own edges that are smooth but with one bristle at the apex of the leaf. The acorns of the white oak group mature more quickly than the fruits on the red oaks do, taking just one growing season to develop fully. The acorns of the red oaks usually need two growing seasons to mature. This means that as the older acorns mature and new ones develop, there will be acorns of different sizes on the tree at one time. The white oak acorns will have a shell that lacks any hair on the interior portions and the meat of the white oak acorn does not have a bitter taste. Red oak trees do have tiny hairs growing on the insides of their shells and the meat from these acorns has a bitter taste. The color and texture of the bark on oak trees can help you to discern the red oaks from the white oaks. You will notice that white oak is usually some sort of grayish shade, whether light or dark, and that the bark will appear to have a scaly appearance and feel to it. The red oaks have a much darker bark, with some so dark that they may even look almost black. The red oaks bark will normally have deep furrows running through it, with ridges crisscrossing the trunk. The red and white oaks grow across the United States and Canada. In the white oak group, the white, bur, overcup, post, Chapman, chestnut, swamp chestnut, swamp white and chinkapin oaks are all in the eastern half of the continent. The Gambel, Oregon white and California white oaks grow in the Far West. The red oaks have several eastern species like the myrtle oak, bear oak and turkey oak, but have a larger presence in the western states, with types existing there such as the blue oak, California black oak, canyon live oak, interior live oak, silverleaf oak, Engelmann oak and emory oak. The live oaks are part of the red oak group and get their names from the facts that while other oak trees shed their leaves, these types retain them through the winter. The live oaks are evergreen, with old leaves falling off and replacements quickly growing in. The oaks such as the willow oaks and the laurel oaks will feature elongated and narrowed leaves; these species are part of the red oak group. The chestnut oaks, which all occur in the eastern United States, have leaves with marginal teeth that all look like the leaves of the chestnut tree, with the same oblong shape.